Industry 4.0 with a shopfloor theme takes in: connected technology on the process input side – smart tools, tool management, tool presetting; simulation of the real world (digital twinning); in-machine intelligence/automatic corrections, based on sensors and local computing power; and generation of data by production assets, its collection, analysis and meaningful display, followed by action to improve machine performance and/or quality of output, either automatically or via human intervention. At its simplest, Industry 4.0 takes in digitally-connected production equipment able to output useful, actionable data, but some of what is corralled under the Industry 4.0 heading has been in existence for some time. Let’s start with a simple example, as shown at the UK’s recent MACH 2018 exhibition held in April this year, Bluetooth-connected cutting tools. They have been available for years; boring tool specialist Rigibore (https://is.gd/onejew) had this as an innovation a while back (ActiveEdge – video: https://is.gd/owazay), but BIG Kaiser (Industrial Tooling Corporation, https://is.gd/etamit) has added a modern tweak with its EWE digital fine boring head that boasts Bluetooth connection to a smartphone or tablet app. This supports simplified tool monitoring and configuration, and the app also helps operators determine optimal cutting parameters for their tool assemblies and displays changes in cutting diameters. In addition, the app logs tool adjustment history for future reference. Taking connectivity and data processing to the next level and fulfilling Industry 4.0 more fully in the cutting tool area is Sandvik Coromant (https://is.gd/uyodup). At Chicago’s IMTS exhibition in 2016, the company unveiled its CoroPlus product platform (it will get an outing at AMB, p29). This, it said, heralded the start of a series of connected products in the areas of pre-machining, in-machine adjustments and post-machining analytics (video: https://is.gd/awidig). It takes in CAM software tool guidance and geometry, toolpath generation for specialist tools, tooling having sensors to deliver in-cut intelligence, app-based tool adjustment and cloud-based analytics. Sandvik Group company Walter (https://is.gd/xowamo) acquired app platform Comara in 2017, saying at the EMO exhibition that same year that with this it will “be able to connect tools with greater sophistication and optimise them using real-time data in future. Combined with the existing ‘Walter ToolID’, this will give rise to the production of ‘Smart Tools’ in future”. Another tooling company, Komet, also boasts tooling capable of data output, cloud-based analytics and dashboard feedback – Komet was acquired by the Ceratizit group (https://is.gd/habuwu) in late 2017. Just prior to that, Ceratizit revealed cloud-based tracking of tools and their history (number of regrinds, for instance) at EMO 2017. Tools are marked with a one-time unique data matrix code, according to the well-recognised and widely used Global Trade Item Number (GTIN – www.gtin.info). Then, via established cloud platform One Identity (www.oneidentity.com), users can scan, using the free One Identity phone app, a tool’s code at point of use to discover information about it, such as is it genuine, how many times has it been reground and what are its technical cutting data. 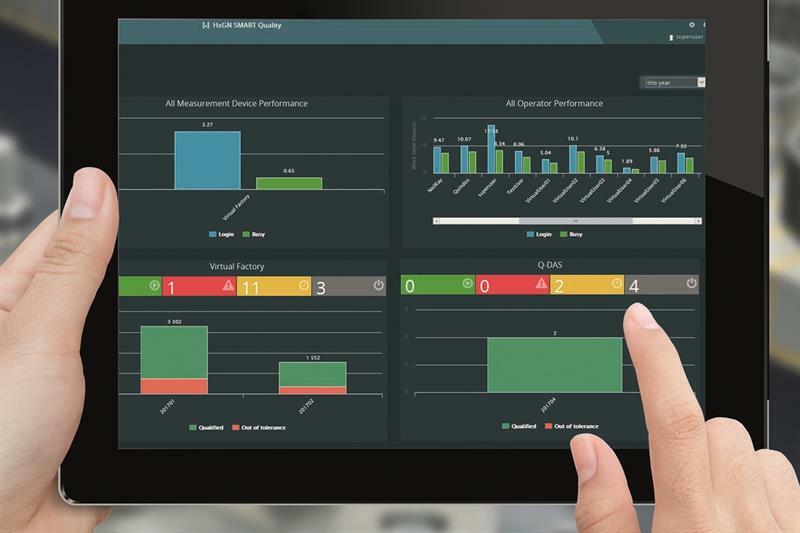 Also in the cloud is Sandvik Group company TDM (https://is.gd/uniciw), a tool management software expert, with its TDM Cloud Line (“the world’s first cloud-based solution for tool data management”), based on its TDM 2017 Global Line tool management system. The key advantage of this is that users can download and manage data from thousands of tools (from a TDM cloud catalogue of verified accurate and complete tool data), without having to purchase the tools first. Mapal (https://is.gd/qoboyi) is also offering cloud-based tool management, on the c-Com cloud platform. Downtime due to missing tools, time-consuming data trawls, restarts and tool selection difficulties are eliminated, with automatic analyses of data on production dates, current stock levels, tool reconditioning status and tool costs per component available. Of course, cloud-hosted tooling information predates these initiatives, with MachiningCloud (www.machiningcloud.com) having been offering tool data to better support simulation in CAM systems for a few years now. This platform has many well-known tooling partners, including Kennametal (https://is.gd/ocuhiq), although that company also offers its own app-based Novo platform that offers a suite of “powerful digital tools” that brings together: process planning; inventory availability and purchase; cost-per-part management; and productivity improvements. Fellow German tool presetter firm Kelch offers a different Industry 4.0 package, applying this to a set of three Smart Factory Services of Engineering Services, Tool Services and Financial Services. These take in a consultancy role, supported by the firm’s hardware and software solutions. On tooling, it offers to “reduce the diversity of tools, optimise their assembly and service life and manage procurement and storage”; the firm’s presetters and shrink-fit hardware support that effort. In the metrology area and starting again with Bluetooth-connected technology, that has been available from Bowers Group for some time, but MACH 2018 saw the company link that to Sylvac software package Sylcom for data analysis and display. Placing it firmly in the Industry 4.0 camp, the company also showed a Sylvac-Scan unit serviced by a collaborative robot from Universal Robots (RARUK Automation, https://is.gd/redaya). The Sylvac-Scan communicated directly with the robot, sending it information for part classification and status; such as pass, fail or rework. A bigger vision in the metrology area is offered by Hexagon Manufacturing Intelligence (HMI, https://is.gd/daguku), however. Machinery explained what ‘Manufacturing Intelligence’ meant in detail last year (https://is.gd/yefare), following attendance at the company’s annual HxGN Live gathering in Las Vegas. HMI’s scope of technology is wide, taking in post-design simulation, machine tool simulation (it now owns NCSimul author Springer as of June), CAM software, sheet metal design and costing software, tool management software, a broad range of metrology and an online corporate quality data capture, analysis and dashboard/cockpit display platform, Smart Quality. Part of the HMI message is quality data feedback for process control (a well-established activity), but the vision also takes in feedback to improve designs and also, potentially, the use of machine tool error maps (measured using HMI technology) within CAM, so that output NC programs can take account of known errors (simulating the real world, so a kind of digital twinning). And Smart Quality delivers actionable information from connected metrology to underpin improvement and productivity increase within and across sites. But let’s move onto machine tools themselves. Data output and related action are key, with this data supply supported by increasing numbers of in-built sensors. Now, software such as that from Seiki Systems (https://is.gd/fuhico) that connects to machine tool CNC units has been around for years and has provided actionable data to improve shopfloor performance by measuring machine activity and providing a network to transmit information to/from machines. This type of software now sits within Industry 4.0, and CNC Training Academy (https://is.gd/edocag) chose to move into this area earlier this year, taking on Predator machine monitoring software. Machine tool suppliers offer their own software to monitor and boost machine performance. Mazak’s iSMART Factory Industry 4.0 solutions (https://is.gd/otocah) works in partnership with the company’s Smooth CNC Technology to improve overall equipment effectiveness and facilitate data-driven manufacturing via connection of factory and office networks. Our March issue carried a full report on this (https://is.gd/kagije). DMG Mori has its CELOS CNC interface and related apps (online article: https://is.gd/beyiso). Launching this year, CELOS V5 will cover everything from planning through production planning, right up to monitoring. In similar vein, Okuma (NCMT, https://is.gd/pucuxe) has its Connect Plan solution and Makino (also NCMT) its ProNetConnex. Some of these allow for the inclusion of others’ machine tools in the connected network and some connect to cloud platforms (see later) such as Forcam (https://is.gd/ucodag) to provide data analysis and dashboard information display. In similar vein, CNC expert Heidenhain (https://is.gd/ivugiv) offers its Connected Machining that allows: connection or access to ERP systems, manufacturing process data, CAD and CAM; supports job scheduling; generates tools required lists; and presents a real-time overview of machine and job status, sending messages to computers throughout the company, as well as to mobile devices. Turning to the integration of sensors within machine tools, this is something of longstanding. Temperature compensation is probably the most established, with vibration and chatter analysis/control more recent. Many machine tool makers can offer examples. But the number of sensors and the volume of data produced is what pushes this into the Industry 4.0 area, with analysis of high volumes of information using artificial intelligence (AI) an associated element. It has also developed AI Feed Forward that reduces mechanical vibration caused by acceleration/deceleration. This is based on a dimensional model that represents mechanical characteristics more accurately and which has too many parameters to tune manually, as has been done up to now, FANUC underlines. Machine learning is used to determine servo parameters, offering high quality machining, due to reduced mechanical vibration. Both achieved locally within the machine, Siemens (https://is.gd/tuvefa) offers its Industrial Edge technology to support machine-based processing of high volumes of data to support “executing a range of descriptive, diagnostic, predictive and prescriptive analytical applications”. Heller (https://is.gd/fapeva) is making use of this technology to support such things as an imaging method comparable to magnetic resonance imaging that sees a high resolution image of the workpiece displayed via a web browser and the operating panel of the machine, without requiring cameras or additional sensors in the machine. Finally, there are cloud platforms such as Siemens MindSphere and FANUC’s FIELD (to be launched in Europe later this year). MindSphere is an open Internet of Things (IoT) operating system that connects products, plants, systems and machines, enabling users to harness data generated by the IoT and apply advanced analytics. It also incorporates apps – Manage MyMachines displays critical machine data, status of machines and machine history. Increased machine availability, reduced downtime and new digital offerings for customers are its underlined benefits. Heller is making use of the MindSphere platform to support a cloud-connected condition-monitoring app that can either provide customers with highest system uptime for the machines that they have purchased, or, additionally, can allow them to pay for the use of the machines without buying them outright. Earlier this year, Studer (https://is.gd/ulonos) presented three apps – Production Manager, Remote Service and Service Monitor, although the cloud service provider was not named. The first visualises machine data, the second supports remote machine diagnostics and the last makes it easier to consult operating instructions related to maintenance tasks (see article: https://is.gd/exubew). A cloud initiative launched by a group of manufacturing technology suppliers, ADAMOS (https://is.gd/yawofa), aims to offer an independent cloud-based IIoT (Industrial Internet of Things) platform with services for smaller machine tool making companies not able to develop their own platform for the provision of cloud-based customer services. It “provides IT services for manufacturing, stores and analyses production-relevant data”. DMG Mori is a partner in ADAMOS. German machine/laser maker Trumpf is behind the Axoom platform (www.axoom.com), which provides a cloud-hosted business software solution, from order to despatch, taking in machine monitoring and management, and more. Another cloud example is Forcam’s Advanced Shop Floor Management Technology that reduces downtime, errors and scrap to a minimum – or eliminates them all together, taking data to do so from connected machines.